"Do I Need A Helmet?" I was recently asked via e-mail, "when is it recommended that you wear your helmet?" I was asked this question due to a response I sent out to our local club, because of an incident that happened earlier that day during a club practice session. When I read the e-mail entitled "20 stitches, but all is well" I knew the e-mail would be worth reading and I would be sharing some thoughts after reading the tale. They say a picture is worth a thousand words. In this case they are right. "King Neptune vented his wrath upon me. It all happened so fast that I really don't know what happened. I was paddling through some rocks when a powerful wave caught me at an angle I wasn't expecting, with my paddle on the opposite side of the boat from the wave I simply couldn't brace. The result was that my face came to blows on one of Neptune's well placed rocks. The rock won. I ended upside down on the rock with my boat about 5 feet above the water. I had several concerns at this moment, but my primary fear was that my helmet had become dislodged and it was no longer protecting my head. I needed to get out of there fast so I managed to scurry out of the boat quickly and into the water where the next wave flushed me into the clear." My response to "when do I need a helmet?" was very simple. The general rule of thumb is to wear your helmet when there is a chance to hit your head on something hard. I elaborated with the usual specifics: rock gardens, caving, surf launching & landings. In fact the use of helmets is becoming more widespread. A few tour companies require the helmets to be worn while in the kayak regardless of the conditions. I know some paddlers who always wear a helmet. I wear my helmet when surfing, caving and during most surf launches and landings. If I know the area and the waves are not big I may launch and land without a helmet. However, I know I am taking a calculated risk. I wanted to discuss helmet use, because of Dave's unfortunate accident. In Dave's case the helmet was forced off of his head. That is the main reason why I am reflecting on helmet use this month. If someone gets a head injury and they are not wearing a helmet most of us will say "thats what you get for not wearing a helmet." However, what do you say if they were wearing a helmet? Since I didn't know why the helmet came off of Dave's head I shared some personal experiences with the local club members. Since helmets are usually designed for fresh water (whitewater paddlers) the materials used can erode due to the affects of salt water. My first helmet had the rivets rust off and the helmet was ripped from my head by a big wave while playing in the surf zone. The strap detached at the rivet connection. I decided to use a screw and locking nut to fasten my straps to my helmet. As a side note, all of the helmets used in the UCSB program over the years needed to have the straps bolted to the helmet, because the rivets rusted out. I mention this because you should wash your helmet after each use in fresh water. In addition, you should test the structural integrity of the straps, buckles and attachment points and replace as needed. Another helmet experience was when I was too confident when entering a cave on a calm day. There were no swells to be seen as I approached a very familiar cave. I had been watching for swells for well over five minutes. Overall the day was a calm one. I donned my helmet as a precaution, but I didn't close the chin strap buckle. After being in the cave for a few minutes I heard that very unmistakable sound of thunder coming my way. I knew what it was and that I just had a few seconds to turn to hit the wall of water with my bow. I was tossed off my sit on top and my helmet went flying. When I was in the water I had to decide to either go for my helmet or my boat. I went for the helmet, got it on my head and buckled it before the next wave hit. I went under the wave and my mischievous boat actually hit my helmet-covered head. I love learning lessons the hard way as long as I live to tell the tale. 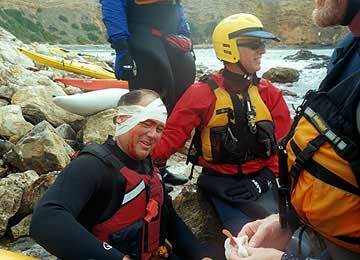 If you are intending to kayak in rocky areas you may wish to consider a helmet with a face guard. Barnacle encrusted rocks can do a lot of damage around your face even if you have a helmet on. The Tsunami rangers wear body armor when they play on the edge. Elbow pads, knee pads, shoulder pads, forearm pads, gloves, etc, are available for those who like jousting with hard stationary objects. I am a strong believer of taking responsibility for your actions and having the freedom to make your own choices. I am a defender of those who enjoy high risk activities. As an instructor, I feel an obligation to present as much information as I can so my students can make their own informed decision. Once they make their decision they will be dealing with the consequences of their actions. Aside from the obvious times to wear a helmet here are a few others. 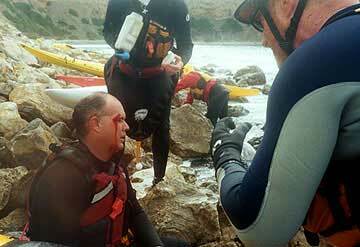 I have seen paddlers get hit in the head by kayaks and paddles during recovery practice. When birds take off they lighten their load and also have a tendency to dislodge rocks from the cliffs above. Swimming in a surf zone with a loose kayak is a sure head banger. Launching or landing from a mother ship can cause some bumps. Watch out for those cross beams when paddling under piers. As for helmet design and styles, I will leave that up to you and a Google search. Helmet design has improved over the years. The inclusion of nape straps (straps that secure the back of the head) have improved the fit and reliability of helmets. There are some companies that have actually done quality research as to helmet designs and materials. While I like to look good too, function should be more of a priority than fashion or color. As I said earlier, wear your helmet when you think there is a chance to hit your head on something hard. Also, make sure the helmet is secure. Here is the result of what happens when the helmet comes loose. Imagine if Dave didn't have a helmet. It is also worth mentioning the support that Dave received from his paddling buddies. I am sure there was the usual MANLY type jokes being thrown around at Dave's expense, but you better believe his paddling partners took care of his needs and cleaned and dressed his wounds. I personally know these guys. They like to play hard and they asses their risks. They are also right on the spot, when someone needs assistance. Earlier I mentioned that I support a persons right to taking risks. I will add that taking foolish risks can not only put you in jeopardy (which is your choice), but it should NOT put the others in your group at risk. A conscientious group will try to save the daredevil when the daredevil gets hurt, which increases the group's risk during the rescue. I raise this point, because I think the members of a group need to make choices as to whom they paddle with and agree to the level of risk for the days adventure. That doesn't mean accidents, incidents or injuries cannot occur. In this example, Dave was prepared and so was the group. Yet an injury occurred. The group was also prepared to deal with the injury. That is how the system should work if you and your paddling buddies practice your skills and bring adequate equipment and supplies. This group had a first aid kit, fresh water and looks like they used it well. Do you paddle with a first aid kit? If no, why not? This also opens a discussion about first aid training. As the level of risk rises, so should the level of first aid training. There should be a few in the group (if not all) with proper first aid training. It would be a shame if the only one in the group with proper training was the one who got hurt. I want to thank Dublin Dave for allowing me to share his accident in this article. When I asked for permission he said "anything to help promote sea kayaking safety." Also, thanks to Duane Strosaker for providing the pictures. So there you have it. If you want to protect your head wear a helmet. If you want to protect more than your head add more protection. Most importantly, make sure you double check your chin straps and buckles. Also make sure your helmet design and head shape coincide so your helmet cannot come off of your head when secured. To test your helmet, put your helmet on and secure it as you would on a normal paddle. Try to work it off of your head to see if King Neptune can do it later. If the helmet does come off when secure, it is time to shop for a new helmet. As for shopping for a new head, I think I will leave that subject for another time.